A black and white negative of an unidentified woman taken for her passport on March 5, 1938. There is a wall behind her and a table with a lamp on the right side of the photograph. The negative envelope refers to her as Mrs. Thorndyke's sister. 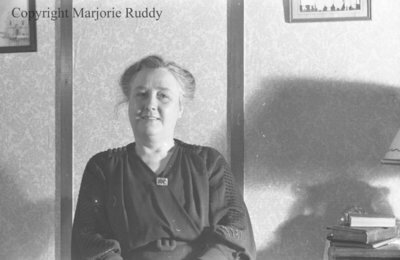 Unidentified Woman, March 5, 1938, Marjorie Ruddy. Whitby Archives A2013_040_900C.